Pro-Working: What Is It & Why Is It Better Than Co-Working? The practice of ‘co-working’ is quickly becoming such a popular working set-up that it hardly needs an introduction. Its more sophisticated sibling ‘pro-working’ is perhaps a bit less understood, yet offers a plethora of fantastic advantages. In this article, we will outline a few of the major differences between the two and the reasons why pro-working could be beneficial to your business. Pro-working is a flexible way of working for business teams or individuals within a dedicated shared work space or business centre, akin to co-working. Like co-working, members have access to fixed desks, hot desks, meeting rooms and communal break spaces. However, pro-working is more professional and prioritises providing its members with quality, sophistication and partnership. Think of the difference between co-working and pro-working as similar to that between a standard hotel and its five-star counterpart. Both offer core services, but the latter is simply a step-up in terms of professionalism. What Are The Advantages Of Pro-Working Over Co-Working? We have provided further information on how each of these benefits manifest below. Co-working provides the necessities required to ensure members can work productively and with flexibility. Pro-working goes one step further. Of course, pro-working members still have access to desks, WiFi, ergonomic chairs, secure storage, bookable meeting rooms and casual break-out areas, like their co-working counterparts. However, pro-workers are then offered additional facilities that would not necessarily be available at all co-working spaces. These include showering facilities, bike racks, high-tech ‘plug-in & play’ meeting rooms, catering facilities and high-speed internet. For example, at Us&Co, we are especially proud of our Members Club Space that all our members get access to as a communal breakout area , and are also bookable as event venues by external users. 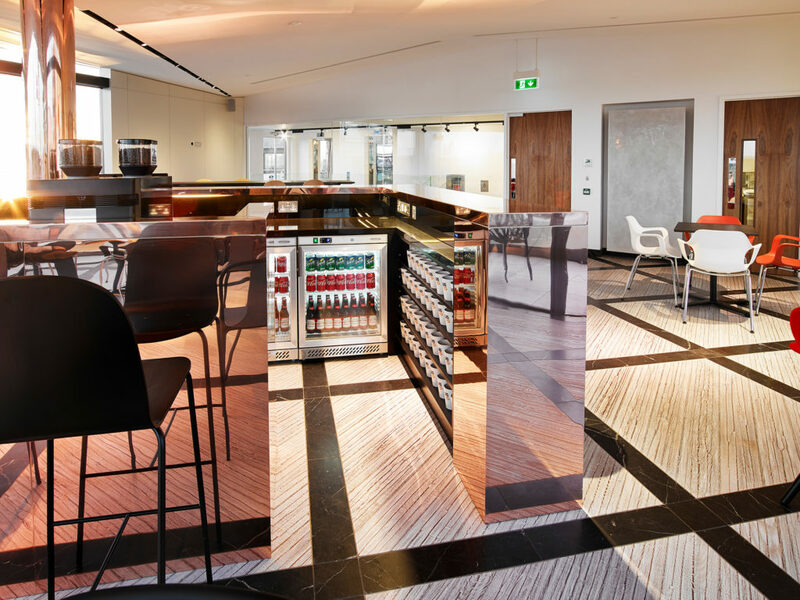 With a stunning copper bar in the centre, stylish cafe-style seating and beautiful views of the surrounding areas, these event spaces provide professional and sophisticated networking venues. Whether you’re a start-up company or a flourishing brand, every business needs to host and impress on occasion. Sometimes it’s investors, clients, partners or potential new team-members, but it is always crucial to set the right impression. This is something you are much more likely to achieve with pro-working rather than co-working. 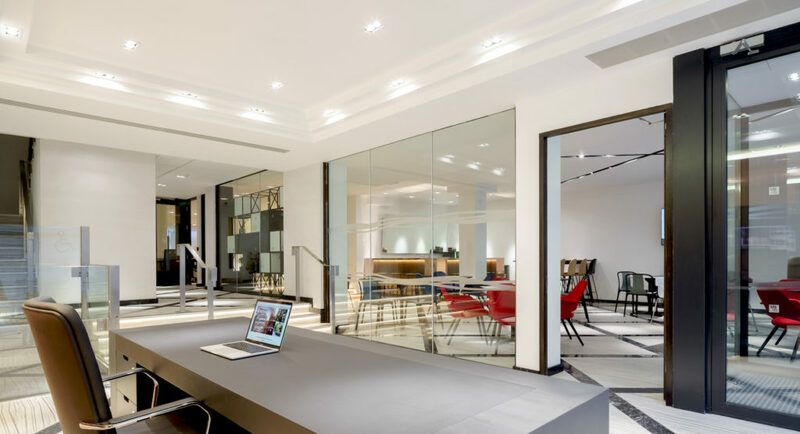 Pro-working spaces are often designed with sleek and sophisticated decoration, high quality furniture and with a focus on productivity and professionalism. What’s more, pro-working meeting rooms are often of excellent quality, providing much more than the bare-minimum simple table and chairs. You can impress your attendees with high-tech ‘plug-in & play’ presentation set-ups, whiteboards, lots of natural light and even sound-reducing devices for added privacy. 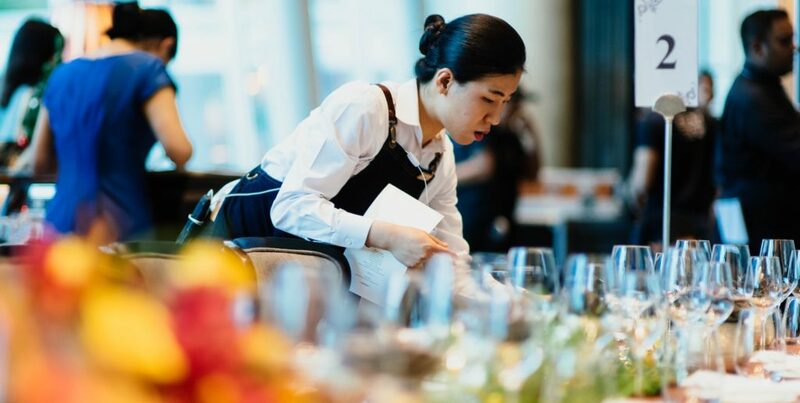 Much like how 5-star hotels provide concierge service, a helpful reception desk and a team of behind-the-scenes cleaners, caterers and operations staff, you can expect a similar level of dedicated on-site service from pro-working centres. Co-working centres are often quite autonomous, without the regular presence of the provider. By contrast, pro-working work spaces are likely to have team members on-site most days of the week. Us&Co members and guests, for example, are greeted by our friendly receptionist. There are then always team-members on-hand for any questions or concerns. You will often find us enjoying the facilities ourselves, relaxing in the break-out spaces or working from a hot desk. Pro-working companies don’t just see their members as desks to be filled or names on a database, they really care about forming lasting partnerships and relationships with the people that come through their door. Here at Us&Co, we are personally invested in the success of our members, and thrive on seeing businesses grow and flourish within our own walls. We therefore design our entire pro-working ethos around providing our members with the active support, facilities and partnership that will help brands achieve their goals. Whether it’s networking assistance, introducing you to other members that we know will compliment your objectives, or simply checking in over Friday drinks, the pro-working approach allows us to feel as though we are part of your extended team. Your wins are our wins. The pro-working set-up suits brands that are looking to impress, flourish and grow, and want more out of their day-to-day working environment than just a desk and a chair. 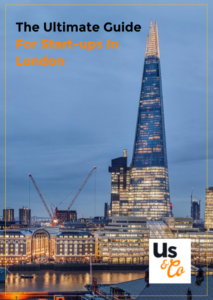 If you are interested in checking out one of our exciting pro-working spaces in London Monument or Dublin St Stephen’s Green, please get in touch with the Us&Co team today. 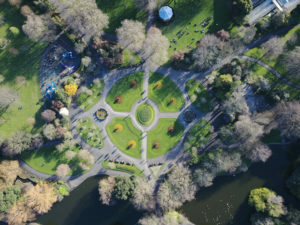 You can call us on 020 3031 3535 for Monument or +353 (1) 529 4100 for Dublin, or fill out our quick enquiry form on our Contact Us page. As the Brexit saga continues to twist and turn, more and more businesses are having to make decisions about what their operations will look like when the UK eventually leaves the European Union. Banks and other financial services face the possibility of losing their ‘EU passport’ should they not move at least some part of their business to homes outside the UK. The loss of this legal mechanism would prevent them from doing business with other EU countries. As a result, it’s predicted that Brexit could lead to as many as 100,000 jobs moving out of the Big Smoke. 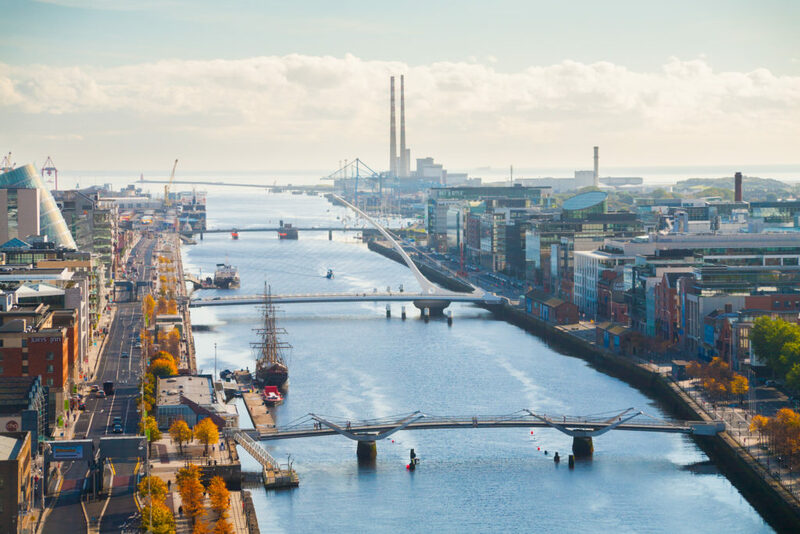 A recent survey of UK-based financial firms identified Dublin as among the most popular choices for relocation in the wake of Brexit. 21 out of 59 of the financial services companies surveyed revealed that they are committed to moving staff or operations to the Irish capital. For example, Barclays is transferring 150 jobs and its new EU base to Dublin, and the Bank of America is doing likewise. It is estimated that – in total – approximately 13,000 financial services jobs will move from London to Dublin. So what makes Dublin so attractive to financial services amongst the uncertainty of Brexit? Being a crucial hub of financial innovation and security will be nothing new to Dublin following the UK’s divorce from the EU. The city has a long-established authority in the financial market, recovering well from the widespread economic downturn of 2008/2009. It is home to over 400 financial institutions that operate on a global scale, as well as being the fifth largest provider of wholesale financial services currently in the EU – behind Luxembourg, Munich, Paris and London. In March 2017, the Global Financial Centres Index described Dublin as one of the “15 centres likely to become more significant” (alongside other cities such as Shanghai and Beijing). The GFCI also recognised the city as a “global leader” for the first time. This glowing resumé certainly suggests that Dublin is well-equipped to handle greater responsibility on the international financial stage. Ireland has a reputation as one of the most open and globally connected countries in the world. As far back as 2013, Forbes rated Ireland as the best country in Europe for doing business. This accolade was further backed-up by some of the biggest companies in the world – Apple, Google, Facebook, Twitter and Amazon – setting up bases there. The capital has fantastic transport connections to other key countries – both inside and outside the European Union. Thanks to newly-launched services to Boston and Miami, Dublin Airport is now the fifth largest airport in Europe for transatlantic connectivity. This is only set to grow. New long-haul destinations are planned to be launched in the coming years, connecting the city to Hong Kong and Montreal, for example. Furthermore, a new runway is scheduled to be completed in 2021, opening up connectivity to Southeast Asia, South America and Southern Africa. An undeniable draw of Dublin is the fact that Ireland has a very competitive tax rate. The 12.5% corporate tax rate for active business is one of the lowest in the world, providing a big advantage over the city’s EU rivals. There is also a tax relief programme set up to support foreign companies in relocating top staff to Ireland. The Special Assignment Relief Programme (SARP) was introduced in 2012 as part of a push to encourage more multinational companies to send key talent to Ireland. This scheme reduces the cost of moving executives to Ireland and is a large part of how the country has boosted its financial reputation over recent years. It is much more convenient to move English-speaking London employees to an English-speaking country. While Frankfurt, Brussels, Paris and Amsterdam are attractive to relocating firms for their mainland-Europe location, communication forms a barrier for some staff-members that simply wouldn’t be an issue with Dublin. However, that is not to say that moving to Ireland would limit interactions with non-English speakers from other European financial hubs. Quite the opposite, as data from the Irish Central Statistics Office shows that over half a million people in Ireland speak a second foreign language fluently. Polish, French and Lithuanian are among the most common second languages in Dublin, followed by German, Russian, Spanish, Romanian, Chinese, Latvian, Portuguese and Arabic. This puts the businesses of the capital in very good stead for interacting with European contacts. In addition to the high rate of language prowess in Ireland, the country has one of the most highly educated workforces in the world. The Organisation for Economic Co-Operation and Development noted that 52% of 25-34 year-olds have a third-level qualification (university standard), compared to the EU average of 42%. Over 30% of students are enrolled in Science, Technology, Engineering and Maths courses, with another 20% studying Social Sciences, Business or Law. This is indicative of a very rich pool of talent in Dublin, from which relocating financial firms can hire a high quality of prospective employees. The 2018 Mercer Quality of Living City Ranking placed Dublin at the top of the list as the best city in which to live in the UK and Ireland. It even bettered popular European cities such as Lisbon, Paris, Madrid and Rome when ranked on a wider scale. 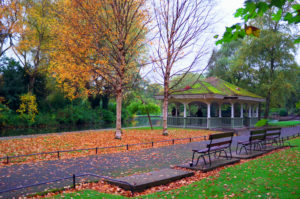 Dublin has a reputation as a very green city, with numerous well-maintained city parks to enjoy and a great range of walking routes and cycle paths. The city is also famous for its food and drink – especially the latter. It is home to a rich array of coffee shops and pubs and – of course – the Guinness Storehouse. Furthermore, Dublin has a stable political environment, notably low levels of pollution and a strong socio-cultural environment. All of these factors highlight why the city is such an attractive choice for businesses relocating in search of an EU base in the wake of Brexit. 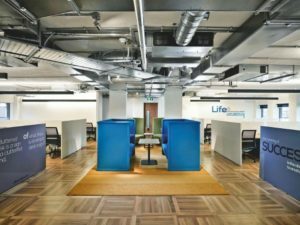 In November 2018, Us & Co opened a brand new professional work space and business centre in St. Stephen’s Green in Dublin 2. 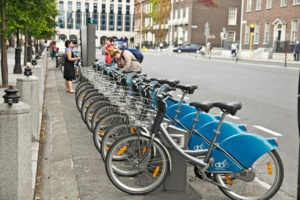 This city centre location, close to Trinity College, Grafton Street and the seat of the Irish Government, has a reputation as the ‘Mayfair of Dublin’. 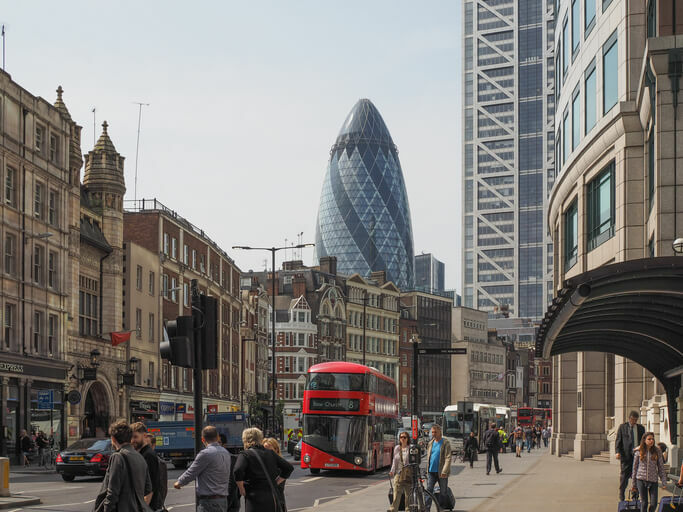 The area is strongly favoured by the banking and financial services industry, and many of our members come from that sector – often looking for an alternative to London as a direct result of the UK leaving the European Union. We provide professional, serviced private offices, co-working memberships (fixed desk or hot desk) and bookable meeting room or event space hire. If you are interested in enquiring, please give the Us & Co team a phonecall on 020 3031 3535, or use our quick contact form. 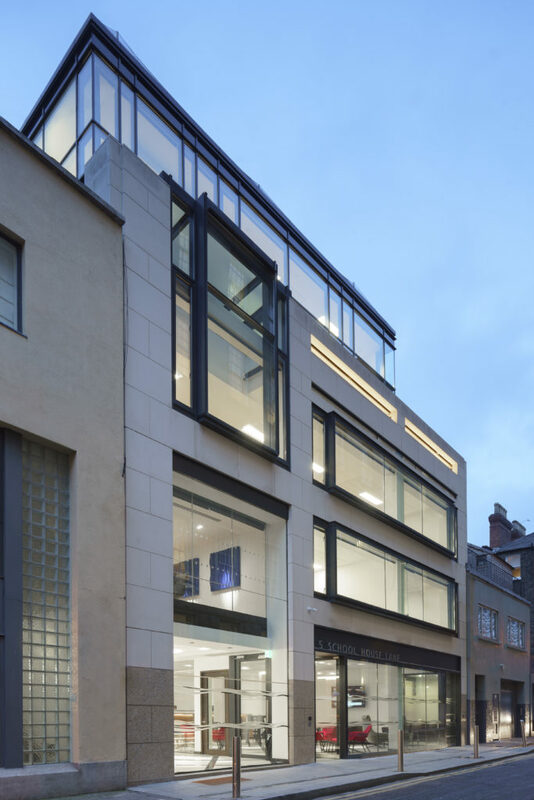 If you wish to come and have a look around our Dublin work space at 5 Schoolhouse Lane East, please book a tour here. Here at Us & Co, we guarantee that our co-working and private office members will never face any hidden costs. Whether you’re looking to rent private offices to single desks, we are up-front about everything that is included in your membership fees and will never ask you to pay more for the ‘extra things’ that make up your co-working experience. We understand how frustrating it can be to be forced to pay additional fees for every little thing. From cleaning services and storage to fast WiFi and printing, co-workers are often charged extra for services that you would be forgiven for assuming were part of what they’ve already paid. Hidden costs outside of membership fees are, unfortunately, fairly common practice in the co-working and private office industries. We are determined to be different. If you are interested in learning more about private office hire or co-working, please check out the rest of our website. If you would like to find out more or book at tour at either of our spaces, please give us a phonecall on 020 3031 3535 (London) or +353 (1) 529 4100 (Dublin). Alternatively, you can contact us here. Sometimes long meetings are unavoidable. For example, quarterly reviews, training sessions or staff workshops can easily stretch to half a day or even a whole 9 to 5. But these long meetings don’t need to be painful. In this blog, we outline our top tips for making the most of a long meeting, helping you ensure they are enjoyable, engaging and productive. One of the best way to energise your team ahead of a big meeting is to offer them a new experience. Give them a break away from the office that they work in every day and meeting rooms that they have already spent many hours in. This works because the human brain naturally seeks out novelty. In a phenomenon known as the ‘coffee shop effect’, changing scenery has been shown to make workers more motivated, productive and creative, through increasing their levels of dopamine. We therefore recommend booking external meeting rooms, especially for long meetings. This will offer your team a welcome change from the everyday and help you lead a more productive and impactful session. When you have a lot to cover, it is tempting to try and do so in one long session. However, doing this can significantly impact how useful the overall meeting will be. For both those running a long meeting and those participating, not having regular breaks will naturally reduce an individual’s productivity and ability to contribute. According to the International Institute for Facilitation and Change, multi-hour meetings should have a break scheduled at least every 90 minutes. Short breaks of just 5 to 10 minutes will make a huge difference to the concentration levels of your team, allowing members to stretch their legs, use the bathroom and drink water. So long as you are clear when participants are expected to return to the meeting room, they will do so re-energised and better equipped to make the most of the session. Not everyone in a meeting responds to the same methods. Some people prefer simply listening to a speaker, so they can make their own notes. Others prefer brainstorming on a whiteboard or receiving hand-outs, so they can focus on participation rather than writing. It is therefore essential that a long meeting doesn’t confine itself to a single method of presentation. Otherwise, there will inevitably be some participants who are less likely to get the most of the session. Also, switching up the mediums you use will add variety to the long meeting, helping to keep your team engaged and interested by offering them something new. There are a great number of mediums that we recommend you take advantage of when running a long meeting. As mentioned, whiteboard brainstorming is a fantastic way to encourage the participation of the whole room. Likewise, easy-to-follow hand-out notes are a hugely effective method of ensuring everyone in the meeting takes away the key points and actions. Other opportunities include: screen presentations, videos, quizzes, worksheets and role-play scenarios. If you are clear from the beginning what a long meeting will entail, you are much more likely to get what you want out of that meeting. Pre-agreed upon meeting agendas are important because they establish the tone of the meeting. They ensure that everyone involved understands the purpose of the meeting, what needs to be achieved and what they should take away from it. Also, they frame the conversation, helping keep topic points to their allotted time-frames and reducing the possibility of distractions or irrelevant questions derailing the conversation. Prior to the meeting, contact the participants with your proposed agenda of the topics you want to address. If anyone has any additional topics to add, it is best that you learn this ahead of time so that you can work it into the timeline of the meeting. An often-overlooked but nonetheless impactful element to consider is whether the meeting space you are using is sufficiently lit. 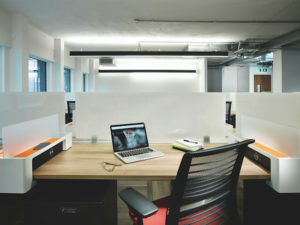 As we discussed in our previous blog post on the ways that natural lighting can improve productivity, offering lots of daylight can really help an individual’s productivity. Natural light improves mood, concentration and even your long-term physical and mental health. This is both the case in an employee’s day-to-day working environment, but also on one-off occasions like long meetings. Hosting your meeting in a meeting room with windows will help your team stay alert and engaged for much longer, which is essential for helping everyone make the most of the day. Especially if your long meeting is a recurring, compulsory event – such as a quarterly review – it is important to show your team that you value their attendance and participation. Offering them simple meetings perks, like catering and drinks, can make a significant difference to their enthusiasm. Also, there is the obvious advantage of ensuring that your participants remain hydrated, energised and alert. Remaining seated for a long meeting is damaging to both your physical health and mental concentration. Instead, you should add an extra element of variety to the session, by encouraging users to spend some of the meeting stood up. You can approach this in a number of ways. For example, you could ask the entire team to stand up around the table; you could encourage individual members to stand at a whiteboard for a particular section; or you could even take the team for a walk to continue the meeting outside. A 2014 study titled ‘Get Up, Stand Up’ found that teams who stood during meetings were more productive than teams who sat in chairs. Some participants also stated that they found standing meetings tended to pass more quickly, as well as finding it easier to participate. At Us & Co, we have some specially designed bookable meeting rooms with high tables, which are perfect for standing meetings. 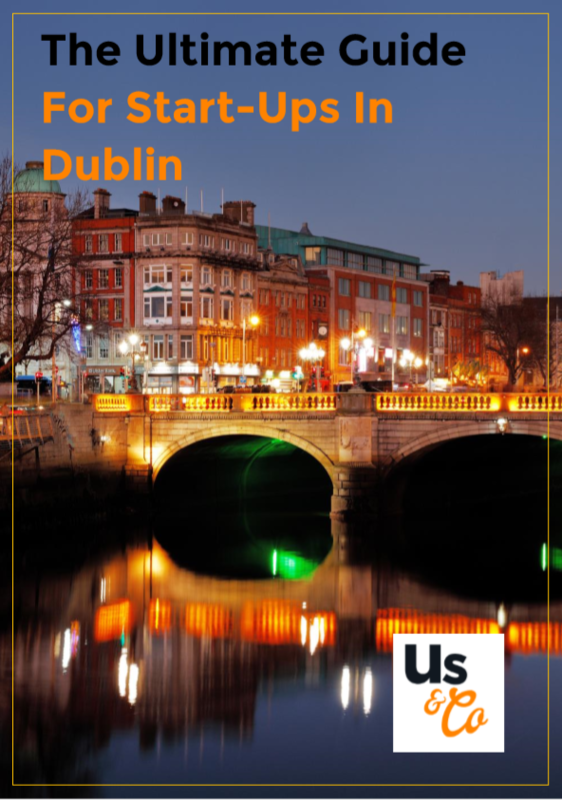 Us & Co offers bookable meeting rooms for both members and external bookings at our work spaces in London and Dublin*. All of our meeting rooms are high-tech, collaborative meeting spaces, equipped for video conferencing, presentations and brainstorming workshops. 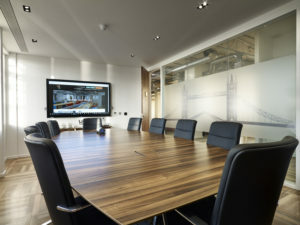 Click here to learn more about meeting room bookings in London Monument, and here for Dublin. *Our brand new Dublin business centre will be opening in October 2018. If you are interested in enquiring about our bookable meeting rooms at this St. Stephen’s Green location, or about any of our other co-working and private office services in Dublin, contact us here or on 020 3031 3535. Research shows that providing workers with access to lots of natural light has a phenomenal impact on their productivity. In this blog, we look at the varying ways that daylight contributes to physical and mental health, efficiency, creativity and overall workplace wellbeing. Neuroscience researchers from Northwestern University in Chicago concluded that there is a strong relationship between workplace daylight exposure and a worker’s sleep quality. They found that workers in offices with windows slept an average of 46 more minutes per night. They also showed signs of much higher overall sleep quality – with more time typically spent in deep sleep – as well as being less likely to experience sleep talking, sleep walking or snoring. The reason for this connection comes down to the impact of lighting on a human’s circadian rhythm. The circadian rhythm dictates the body’s release of hormones (especially melatonin), natural sleep-wake cycle, body temperature and a whole range of other crucial bodily functions. Not receiving enough natural daylight during the working day causes major disruption to this rhythm. Working for lengthy periods of time without daylight directly increases an individual’s risk of developing mental health issues. Depression, bipolar disorder and seasonal affective disorder (SAD) are all linked to disruption to the circadian rhythm. Research also shows that natural light helps people to be generally much happier, calmer and less susceptible to the impact of stress. Mental health problems currently cost the UK economy an estimated £70-100 billion per year, thanks to loss of productivity and earnings, as well as the burden on our health service. With the average UK adult spending approximately 90% of their waking hours indoors, it is becoming more important than ever that employers prioritise staff wellbeing when selecting office space and consider natural lighting in their decision. Another damaging side-effect of not receiving enough natural light is Vitamin D deficiency. Vitamin D is essential for a number of core bodily functions, including regulating the immune system, maintaining body weight and ensuring healthy cognitive function. Deficiencies in the mineral have been conclusively linked to flu, asthma, obesity, diabetes, cardiovascular disease and even cancer. A workplace study conducted by Cohere found that workers in offices without windows took 6.5% more sick leave each year. Artificial light also contributes to eye problems and migraines. Dim lighting forces the eyes to work much harder in order to see, leading to eye strain and headaches. Overly harsh lighting – florescent lighting in particular – makes it more difficult to focus your vision, and is also a known trigger for eye strain and migraines. It is inarguably easier for workers to learn, think creatively and be productive when they are working somewhere with lots of daylight. Research published by Eco Business showed that workplaces with sufficient daylight saw an uplift of between 5 and 40% in productivity and sales. Studies in schools have similarly shown that pupils retain information far better if regularly taught in classrooms with plenty of windows. Playwright and Nobel Prize winner George Bernard Shaw was a strong advocate of the value of natural light for boosting his creativity and productivity. He worked for over 20 years in a specially-built writer’s hut that he designed to stand on a mechanical turntable, allowing him to move the whole studio on its axis to follow the sunlight. Selecting a work space with lots of natural light will ultimately save a company money. On average, 47% of the energy used in an office space is used for space conditioning – controlling the temperature and lighting. 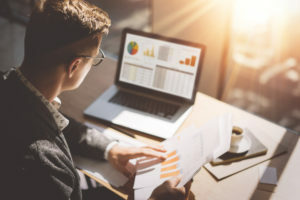 Offices that receive more daylight don’t need to spend as much on heating, air conditioning or artificial light, helping them make significant savings on their energy bills. Cutting down on this unnecessary energy usage also reduces a company’s environmental impact, as well as providing your workers with more fresh air. Our London Monument private office and co-working space provides our members with lots of natural light. Our meeting rooms have large windows and our top-floor club space is surrounded by panoramic views of the Thames and the London city skyline. Click here to learn more about Us & Co London. Party season will soon be upon us and -whether you’re organising an event for your colleagues, family or friends – one of the surest ways to host a memorable occasion is to find a venue with a spectacular view. Especially in London, where the skyline changes every corner you turn around, there are some fantastic views available. 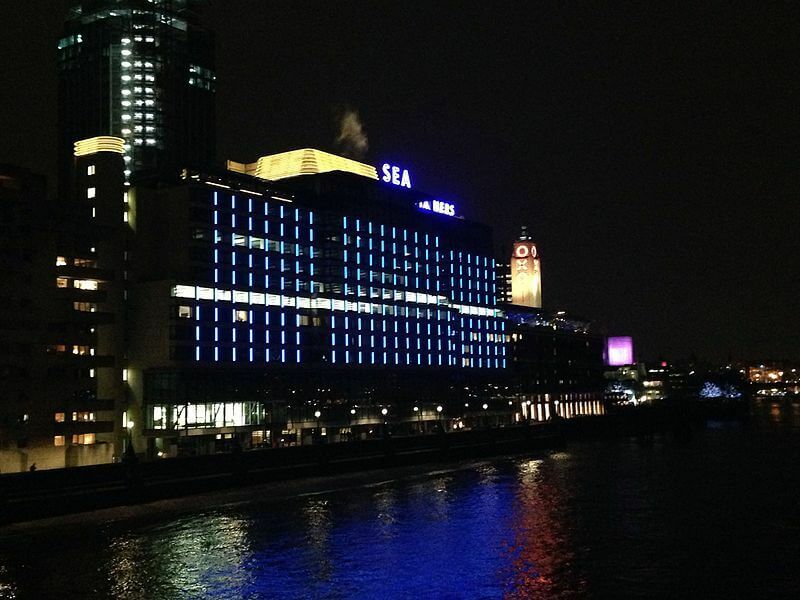 The Sea Containers building on London’s South Bank is a hugely iconic space, with its illuminated letters forming a hugely memorable part of the riverside skyline. Although the building is not normally accessible to the public, the Roof Terrace has been opened as a spectacular alfresco event venue that can cater up to 200 guests. Close to the Tate Modern, London Eye and the Southbank Centre, this exclusive space offers a fantastic view of bustling central London. Shoreditch has a strong reputation as one of the trendiest spots in London, with a plethora of bars, restaurants and clubs. 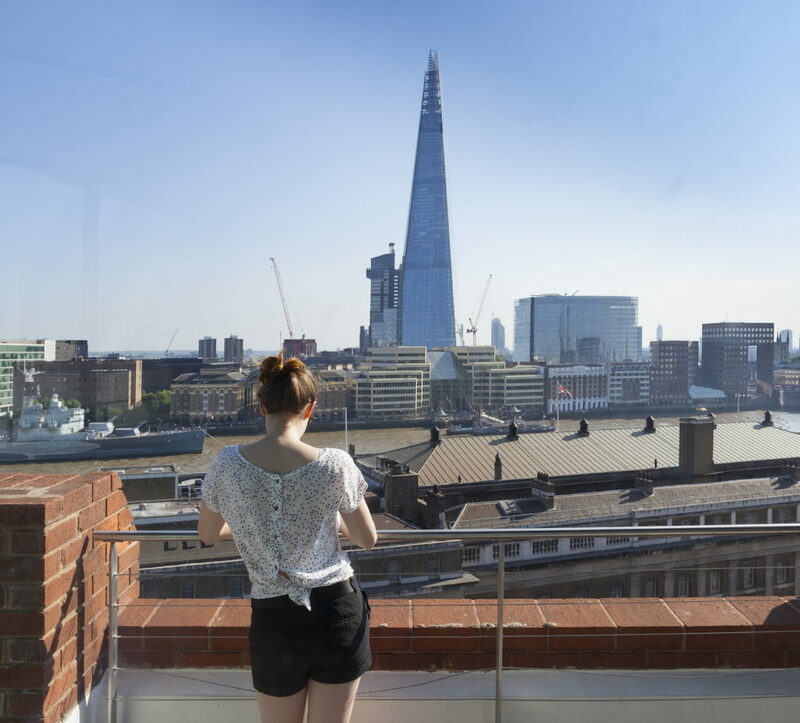 But, if you’re looking to host a summer party somewhere a bit more exclusive and away from all that, the Shoreditch Sky Terrace is an excellent option. Complete with a BBQ kitchen, comfortable seating and a cutting-edge music system, to help you keep your guests fully entertained. Like the Sea Containers Roof Terrace, this venue is ideally suited for larger groups – as it can comfortably host up to 200 guests. 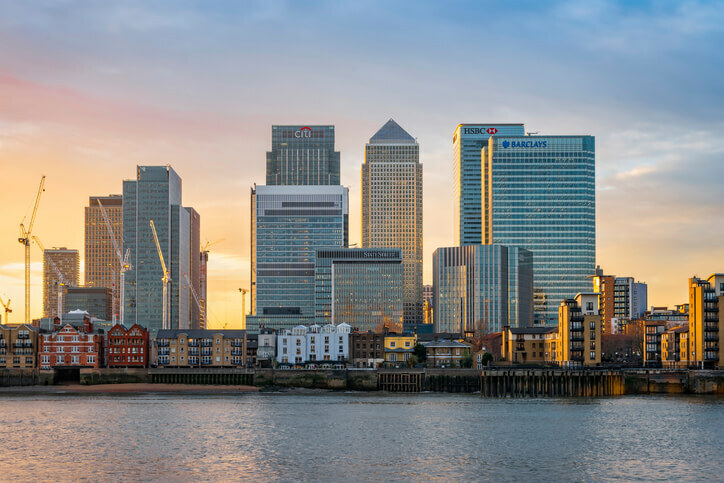 One of the most enticing aspects of Canary Wharf is how the modern financial district and the historic dockland sit side-by-side, making it a hugely memorable location for hosting an event, especially in the summer. 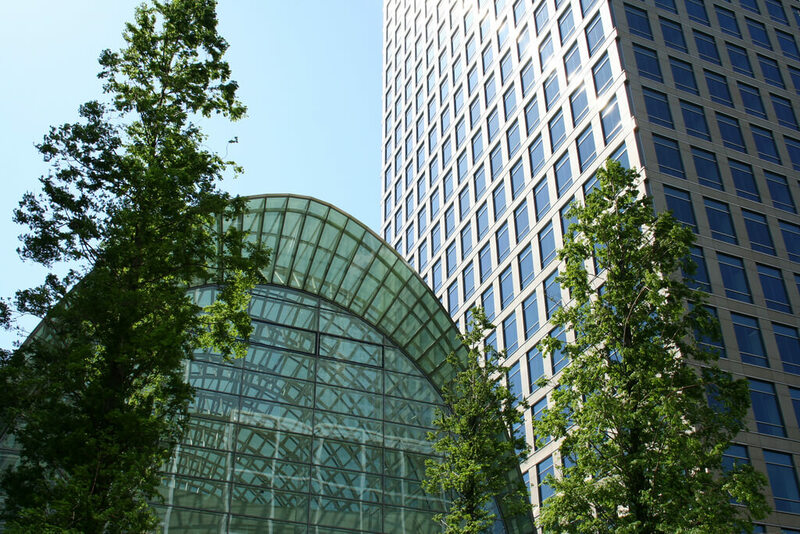 East Wintergarden is a luxury occasion venue, sitting at the heart of the area, nestled in between the iconic skyscrapers and right on the bank of the river – perfect for impressing your guests. 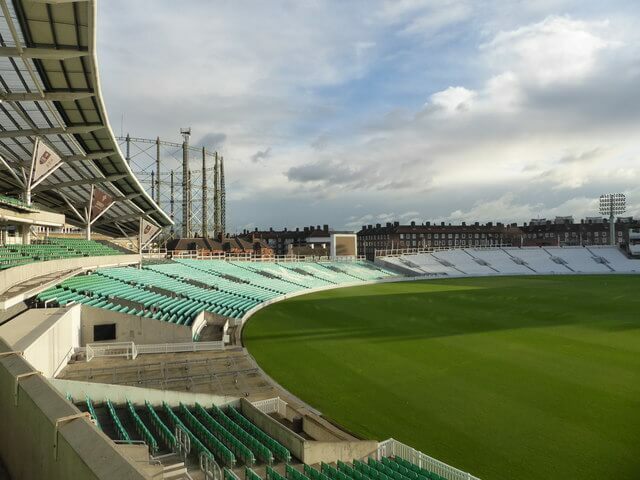 This bright, open event venue is the perfect spot for a summer party with a difference, as it based at the top of the OCS Stand, overlooking the stunning Kia Oval international cricket ground, home of Surrey Cricket Club. Close to Vauxhall and Kennington, this space is considered somewhat of a hidden London gem. With views of the cricket pitch on one side and iconic London landmarks (including the London Eye) on the other, hosting your party at the Corinthian Roof Terrace is a fantastic way to enjoy the best that London has to offer. 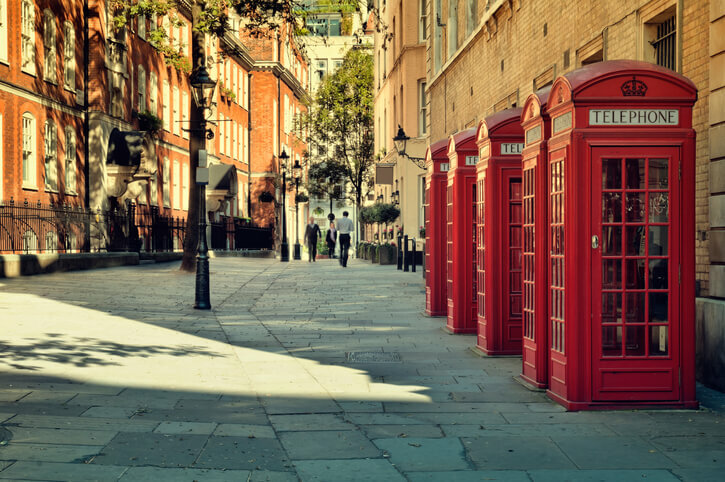 Soho is home to some of the most iconic London landmarks, including the London theatre district and Piccadilly Circus, not to mention being close to Trafalgar Square and the British Museum. If you want to host your summer event in among some of the most recognisable London buildings, the Century Club could be perfect for you. 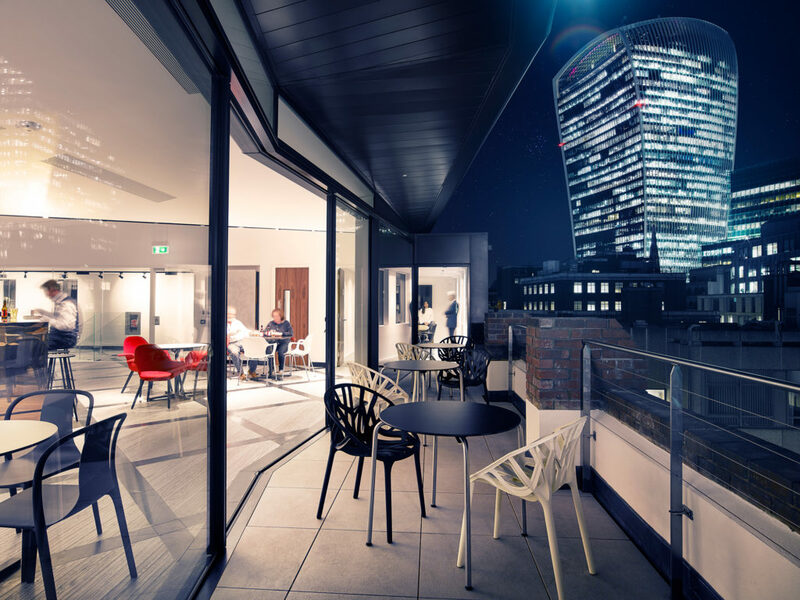 Gazing out over Shaftsbury Avenue, the club’s roof terrace – with a fully retractable roof – is great for offering your guests a memorable party. Memorable party venues are not exclusive to central London, as the spectacular Drum at Wembley proves. 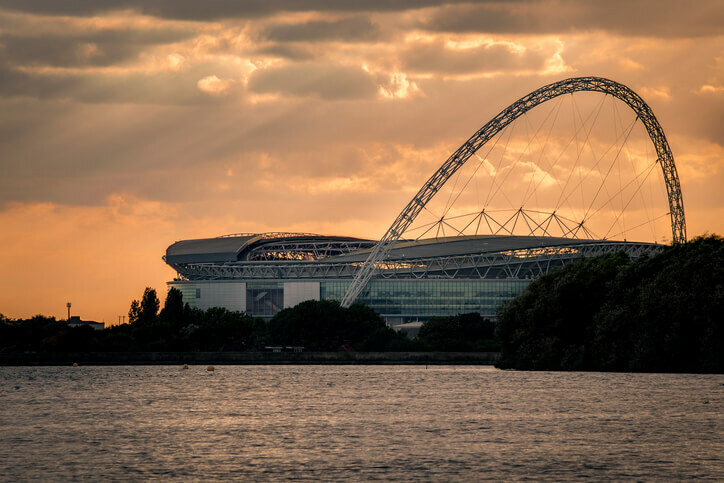 The Winter Garden venue offers floor to ceiling windows, through which you can see excellent views of the nearby Wembley Stadium and Wembley Arena. The space has a capacity for up to 100 guests, with a professional kitchen and on-site events team. We are extremely proud of our very own Club Space at Us & Co Monument, where your guests can enjoy fantastic panoramic views of the London skyline. This intimate City of London venue looks out over the Thames and the Shard and is truly spectacular, especially on a clear summer’s day. With a luxury copper bar at the heart of the room, friendly serving staff and fantastic catering, the Club Space is equipped with everything you need for an event to remember. The space is also available for highly affordable events all year round, including summer or Christmas parties. For more information, including a floor plan and menu, click here.